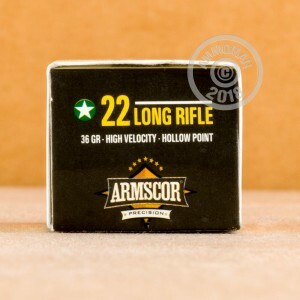 This high velocity rimfire ammunition from Armscor delivers 1,260 fps of muzzle velocity using a light 36 grain hollow point projectile. 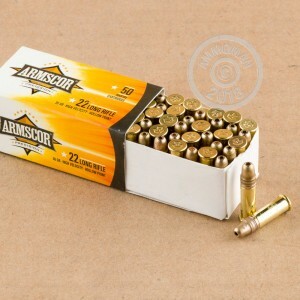 Ideal for bagging varmints or simply shooting paper targets, these rounds come packaged in boxes of 50 and deliver cheap, fun shooting with reasonably good accuracy. Armscor is the largest munitions company in the Philippines and produces ammo in both its home country and the USA. The company is a major supplier to the military of the Philippines and operates a logistics unit under their command. 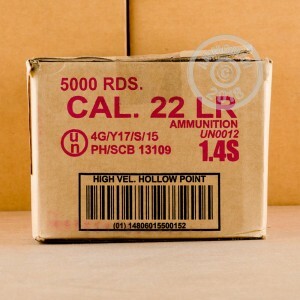 50 rounds isn't nearly enough, so why not grab a couple 500 round bricks or some centerfire or shotgun ammo? Remember, all orders over $99 at AmmoMan.com ship for free. Very decent all around ammo. Bit pricey but not bad. Very decent ammo.Worked well in my Ruger Single six, Marlin and Ruger semi auto rifles and my kid's Ruger semi auto pistol. 300 plus rounds with ZERO ftf and every case ejected cleanly. Excellent shipping speed and service from these fine people.